Charles McGee at U.S. Embassy in Cotonou, Benin, Africa. 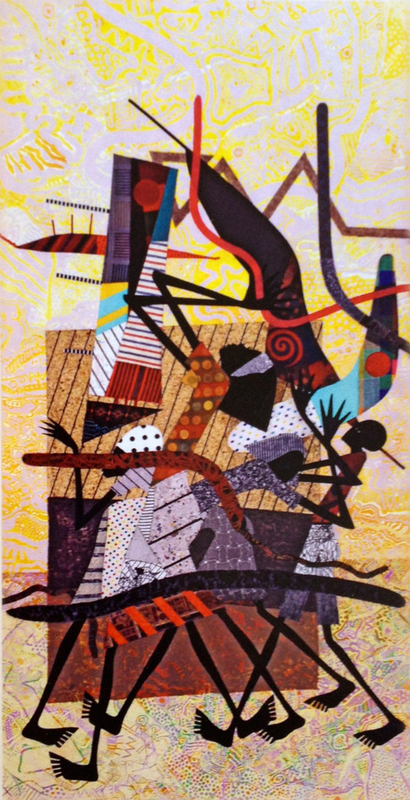 May 2014 – Mongerson Gallery is pleased to announce that Art in Embassies has acquired Charles McGee’s 2009 mixed media work Play Patterns I for the U.S. Embassy’s collection in Cotonou, Benin, Africa. Also available at this time is Play Patterns II. For additional information on the works of Charles McGee, we invite your inquiries via email or by phone (312) 943-2354. About Charles McGee (b. 1924) – Over the past six decades Charles McGee has had a distinguished career that includes hundreds of exhibitions in the United States and abroad as well as many important contributions to Detroit’s cultural and educational community. His paintings, assemblages and sculptures are in prestigious national and international collections and permanently installed at various institutions worldwide. McGee is a mentor, teacher, and community arts advocate, founding the Charles McGee School of Art, Gallery 7, the Contemporary Art Institute of Detroit (CAID) and many other professional art involvements.